Rent the 25' Climbing Wall / Rock Wall for your next special event, church function, birthday party, corporate event or special event. The Portable Climbing Wall is available for rent in Orange County, Los Angeles County and Southern California. 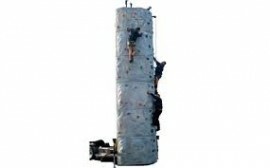 The portable rock wall is perfect for any special event, church function, corporate party, birthday party or any party. Celebrate your event with this Climbing Wall / Rock Wall, perfect for children as well as adults! 300lb. weight limit for each climber. $600 price is for two hours. A mobile climbing wall is perfect for corporate events, military recruiting, malls, fairs, farmer’s markets, marketing and promotions, zoos, water parks, schools and anywhere you can fit a mobile climbing wall! The Extreme mobile climbing wall is perfect for all ages! With the popularity in thrill seeking sports, Extreme’s rock climbing walls have become a safe, exciting, team-building and life changing activity. With the patented Space Saver™ trailer and semi-round climbing wall design, the Edge can operate within a 12ft. x 22ft. operating space and still offer the maximum amount of climbing surface area! This 3 climber was designed to be taller with more surface area, with 3 climbers at one time, you can expect 60+ participants every hour! Customers can experience a life-like climbing experience up to 25 feet (7.62 meters) in the air! Additional delivery charges may apply. Colors may vary. Suitable for climbers between 45 lbs. and 250 lbs.